Look Sharp, Sconnie - Midwestern Fashion Nerd, Chronic Over-thinker: Gone to market. London may have tried to refine me. So I made my way into the depths of Camden Market. Buckets of jewelry, pungent street food, aggressive vendors and vintage clothing (of course), could not have satisfied my cravings any better should they have been wrapped in layers of puff pastry. Sometimes all one needs is a little grease and a little grime. And a life-sized animal statue never hurt. (unless you're Ben Stiller, in which case, I retract the sentiment). They speak to me, guys. I can't help it. But for realz. 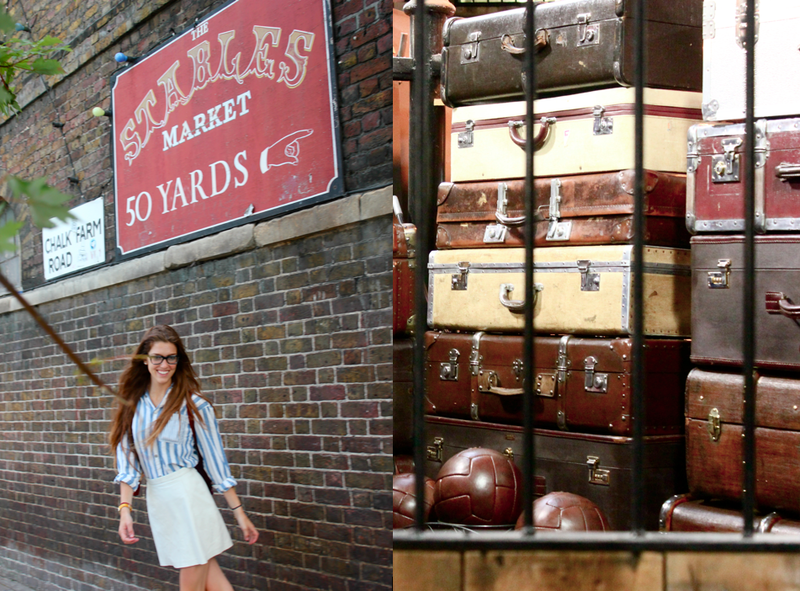 Camden Market's the place to hit up for any self-respecting hipster. Vintage oxfords abound, and a hefty slew of the cheap and chunky. Love that top, looks like a blast! There are some SUUURIOUS treasures to be found there. Jealous. Insanely jealous. I've wanted a set of vintage, beat up trunks or suitcases, and you've dangled this photo in front of me of what appears to me to be my very heart's desire - a sky high pile of the aforementioned! Also, I absolutely love your striped blouse with the collar being solid and the pocked stripe being thinner. Sups cute. thanks for the lovely comment on my blog! I absolutely love your blog, and these photos are beautiful. Your outfit is so classic and chic, and your writing is incredibly relatable and funny. I love how your personality really comes through in your posts. We should follow each other! again, thank you so much for the comment. very nice pics, you look great!! and I really like your style! thank you for sweet comment :) what about following each other? That is cute! Wow camden market looks like heaven! We have a similar marketplace in singapore selling vintage and cheap stuff! I've been to London several times, but I haven't hit up Camden market yet! I'll have to make a point of it on my next visit!